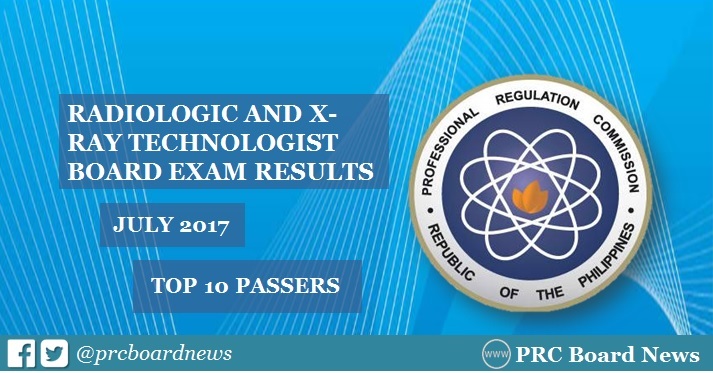 MANILA, Philippines - The full list of topnotchers or top 10 passers for July 2017 Radiologic Technologist (Radtech) and X-Ray Technologist board exam was officially released online in three (3) working days after the exam. The Professional Regulation Commission released results today, August 3, 2017 per PRC Resolution No. 2016-1019. The Radtech and X-Ray Tech board exam was conducted on Sunday and Monday, July 30 and 31 in the cities of Manila, Baguio, Cagayan de Oro, Cebu, Davao, Iloilo, Legaspi and Tuguegarao. View on this page for the names of highest placers, rank and rating. In July 2016, Liceo de Cagayan University graduate Philip John Badong Zuchetti earned the highest place with 89.20%. Our Lady of Guadalupe Colleges alumnus Christian Pardilla Buena garnered the second spot with 88.40%. In the July 2015 Radtech board exam, Patrick Deompoc Agaloos of St. Jude College - Dasmarinas, Cavite and Melanel Shine Reyes Fuentes from Cebu Doctors' University topped the board with identical 89.60%. It was followed by Margaux Fiona Soo Luengo, Davao Doctors College alum, with 89.20%. From which schools will be the topnothers for July 2017 Radtech board examinations?